Black is back. OK, it’s not like black ever went away, it’s just that we’re finding homeowners are more open to really taking a chance on embracing a heavy dose of the dramatic color in their kitchens. Large swaths of black range hoods, island accent colors and even full-on all-black cabinetry has been popping up a lot lately. 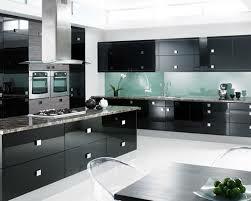 Pair black cabinets with white walls, backsplash and countertops for a dynamic, sophisticated and high-contrast look. I’m so glad I stuck with my black appliances all these years!